Disclaimer.. So I’m new to AngularJ, but I’m really digging it so far. I started putting this together late last night, I guess technically this would be considered a Single Page Application (SPA). I really don’t expect to be working on it past today. It was intended to be a simple project I could crush out quickly. It’s basically a application to help me get through my day to day at work. Through out the work week I deal with a lot of coordinates and Google maps questions. Having a tool that can help me investigate location points is incredibly helpful. Sure I can use Google maps… but this gives me a excuse to do something more about AngularJS. For about 2 years now I’ve been using Itouchmap.com/latlong.html. It’s a great tool but it can be a bit aggravating at times. Meaning the site has ads strategically placed along the rails of the site so there are times when you find your self accidentally move your cursor across a ad which then triggers a pop up video. Those things are the worst! As far as the domain. I use Dynadot.com sometimes to purchases domains because Godaddy is becoming a bit too gangster for me. I still had a few dollars in my account and they had .co on sale for $5.99. I danced around with the idea of purchasing a .co for a long time. Yes it’s cheap but the renewals price in most times end up being something crazy. With .coms you can kind of bet on the price being the same if not close to the purchasing price the following year. yada, yada, yada.. I went with Latlon.co for right now. 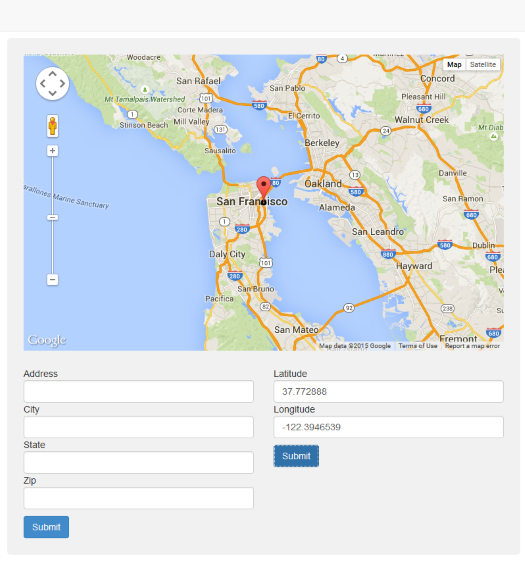 Ipinfo.io to give me a users roundabout Latitude and Longitude via IP address.